Swift Solar is a U.S. startup developing a new class of efficient, lightweight, and flexible solar products based on perovskite semiconductors. Our mission is to fight climate change by making solar energy more affordable and more widely available. As we close our first major funding round this month, I wanted to share a few thoughts on solar energy, why I’m excited to be a part of the Swift team, and where we’re headed as a company. Swift’s story starts with climate change. As a species, we’ve put ourselves and most other life on Earth in grave danger—with more than a little help from Big Oil—by clear-cutting forests, destroying ecosystems, and burning fossil fuels. Today over 60% of the world’s greenhouse gas emissions come from generating and using energy, for electricity, heat, and transportation. There are many different scenarios in which we manage to stop climate change before it’s too late, but every single one requires a massive global shift in how we produce energy. In short, we have to stop burning stuff. From our perspective on Earth, the only true primary energy sources are tidal forces induced by the moon (gravitational), the energy holding atoms together (nuclear), and the sun (radiant). Here’s a chart summarizing these options and how they translate into more familiar energy carriers. Forms of energy (colored boxes) and energy conversion processes (arrows) relevant for electricity generation. Gravitational, nuclear, and chemical energy can be stored for long periods of time with high efficiency; direct storage of thermal, kinetic, or electric energy is much less efficient. Figure credit to Patrick Brown of MIT. The first option—gravitational energy in the form of ocean tides—can be captured with turbines that look like underwater windmills. Tidal energy is available on a predictable cycle, but the global technical potential (in kWh/yr) is likely not enough to satisfy more than a small fraction of energy demand. The second option—nuclear energy—includes fission and fusion technologies. Nuclear fission can already provide reliable baseload power, and personally I think it should be a major part of the climate solution. But many people worry about the risk of accidents and of weaponization of nuclear fuels and products. Unfortunately, these concerns have increased the cost of new nuclear power plants in many countries worldwide. On a related note, you might think of geothermal energy as a form of nuclear: Roughly half of all geothermal energy comes from nuclear decay of radioactive isotopes inside the Earth—the other half is leftover energy from the planet’s formation. Geothermal energy is also limited in total potential. The third option—radiant energy from the sun—is the origin of every other terrestrial energy source. Fossil fuels and biofuels are just integrated sunlight, collected over millions of years or a few months. Wind, wave, and hydro power are sunlight transformed into moving air or water. If you want to power the world forever—without wrecking the only planet we have—solar and its renewable offshoots are the only game in town. Photovoltaics (PV)—or solar cells—convert sunlight straight to electricity. Solar PV is an interesting technology because it can scale down without losing efficiency and scale up to meet the world’s energy needs. That means PV can simultaneously power rural communities in India and replace multi-gigawatt coal-fired power plants in the U.S., all with zero carbon emissions. Solar alone can’t solve climate change—the sun doesn’t always shine and energy production isn’t the only source of carbon emissions—but it can be a huge part of the solution. In this decade, the global PV industry has grown from juvenile to giant—growing in installed capacity by 25x and dropping in cost by 10x. PV costs are already competitive with coal and natural gas in many locations. Yet solar energy today accounts for less than 5% of worldwide electricity. To reach its full potential, solar PV has to become more affordable and more versatile in application. As solar adoption grows, the average value of PV electricity drops because the grid is oversupplied at mid-day when the sun is shining. That means the cost of solar PV will have to keep dropping to stay competitive, either by tacking on energy storage or by tolerating increased curtailment. Most progress in PV so far has been made with crystalline silicon technology. But silicon has a limited power conversion efficiency potential, and it doesn’t absorb light strongly, so silicon solar cells are thick and brittle. The resulting modules are rigid and heavy, because you need a glass cover to protect the cells from cracking and degrading. Today’s 300-watt solar panels are roughly the size and weight of a glass patio door—over 5 feet tall, 40 pounds, and a pain to carry around and install. My co-founders and I started Swift Solar to change what’s possible with PV. We’re creating better solar panels—more efficient, lightweight, flexible, and affordable—to make better products and help realize solar’s full potential to mitigate climate change. Swift is building on a material system that our founders helped pioneer—metal halide perovskites. The term “perovskite” (pronounced per-roff-skite) generally refers to any material with the same crystal structure as calcium titanate—ABX3, where A and B are positive ions and X is a negative ion. The perovskites relevant for solar PV are semiconductors made by combining a metal salt BX2 (e.g., lead iodide, PbI2) with an organic or inorganic halide salt AX (e.g., methylammonium iodide, MAI), sometimes with additional precursors. It turns out that these synthetic perovskites are incredibly good semiconductors, great at absorbing and emitting light and super cheap to make. Starting around 2013, hundreds of research groups around the world jumped into the perovskite field, many with backgrounds in dye-sensitized, organic, polymer, and quantum dot solar cells. Lessons learned from those fields helped perovskites advance faster than any previous technology in the 60+ year history of photovoltaics. 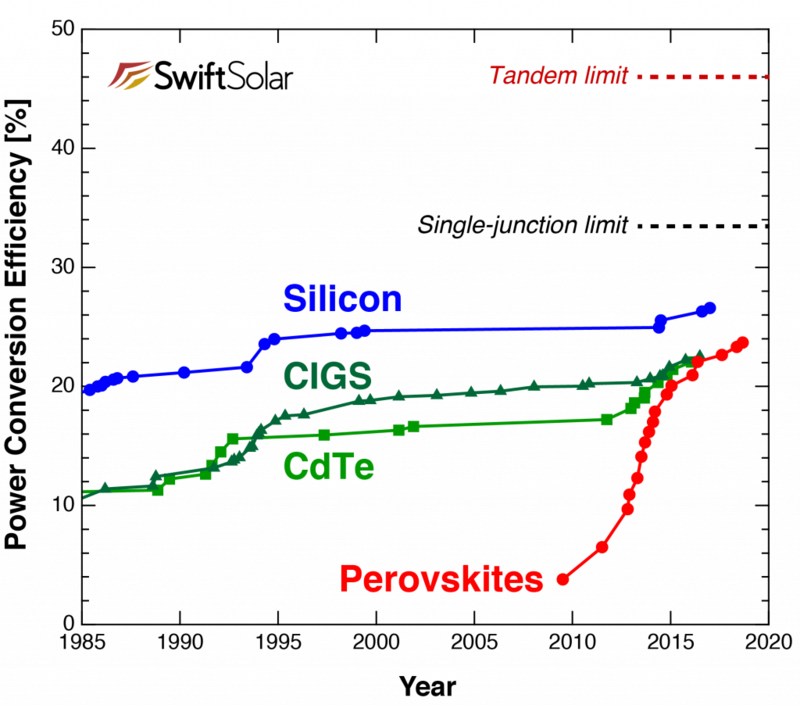 Solar cell efficiency records over time for leading PV technologies—crystalline silicon, copper indium gallium diselenide (CIGS), cadmium telluride (CdTe), and perovskites. Tandem cells can reach a much higher efficiency than single-junction cells. Swift’s core technology is a solar cell made of stacked perovskite cells, each absorbing a different part of the solar spectrum. The use of abundant and widely produced raw materials, aiding rapid scale-up to the terawatt-per-year production levels needed to mitigate climate change. Our founding team started working together in early 2016. All of us had spent years before that in university labs working on perovskites and other PV technologies—developing new materials, device structures, manufacturing processes, policy recommendations, and techno-economic models. We had our first team meeting via Google Hangouts across 3 time zones. At the time it wasn’t clear if we could even start a company together—how would we ever get 6 academics from 5 different countries to settle in the same place? But after 2 years of weekly video calls, our shared vision and excitement finally prevailed. In November 2017, Swift Solar was born. Kevin Bush is a mechanical engineer from Seattle who does things fast—whether it’s a new tool design or his PhD, which he finished in half the usual time. Giles Eperon is British and an incredible scientist—in the lab he does more in 40 hours than I could do in 80, and in his spare time he climbs mountains. Tomas Leijtens is Dutch and the coolest Swift founder, a creative yet practical problem solver, and one of the best team builders I know. Max Hoerantner is Austrian and the heart of the Swift team, a versatile engineer who can code, rebuild an engine, or host a party with a smile on his face. Sam Stranks is an Australian solar cell scientist who assembles collaborative research teams better than anyone, as well as the proud father of 2 empathetic kids—his greatest accomplishment in my book. Me (Joel Jean), I’m an Ohio native, an MIT engineer and climate activist who loves data and does whatever needs to get done. Between the 6 founders, we have 6 PhDs from Stanford, MIT, and Oxford, 3 Forbes 30 Under 30 fellows, 1 TED Fellow, and over 70,000 citations. My co-founders have led and contributed to many of the foundational developments in the field of perovskites. But to me, the most important quality of our team—what makes me happiest about working at Swift—is our shared values: empathy, trust, growth mindset, and a commitment to serving the future. We care about each other, about our communities, about the world. We’re eager to tackle new problems and learn what we don’t know, and we’re not shy about failure—we’ve all been grad students. At Swift, we feel incredibly lucky to be on the ground floor of a technology with such potential for climate mitigation and for the long-term future of energy. We’re realistic about the risks ahead and the steep odds we face in the PV business. That said, having learned from the experiences of many solar companies of the past, we want to make Swift the best solar company of the future. Like any self-respecting solar startup, we’ve gotten our fair share of rejections from prospective investors. In our current funding round, we were fortunate to find investors who share our vision, ending up with a 40% yes rate and a slightly oversubscribed round. Our dedicated backers include mission-driven individuals, VCs, and corporate strategics from across the U.S. Looking forward, we want to work with team members, partners, and investors who share our climate change mission and our long view of the potential of solar energy. We’re looking to build an inclusive and diverse team at our main R&D facility in the San Francisco Bay Area. If you’re like us—if you think turning sunlight into clean electricity to improve lives is one of the coolest ways to use your technical skills or your investment dollars—please get in touch. We look forward to hearing from you! To get regular updates from Swift, join our mailing list and follow us on LinkedIn, Twitter, and Facebook. Joel is a co-founder and CEO of Swift Solar, which is developing a new class of efficient, lightweight, and flexible solar products based on perovskite semiconductors.